I have been laid low this week by a hacking cough and flu-like symptoms. I've not been to Mexico, or anywhere further than Wales recently so you can rest assured that it's just an irritating and inconvenient virus. However said virus has robbed me of all desire to knit this week. I couldn't read either, found myself on the same sentence several times over. Over the weekend I lost my appetite (so unlike me) and, more disturbingly, my usual appreciation of a good cup of coffee (horror!). I'm feeling better today thankfully and have managed a little light Lee Child (nothing too complicated) and some pasta bolognese. I may try some simple knitting later while the football is on. I came round from my fuzzy state to find 53 unread posts in my Google Reader account which I am still catching up on. 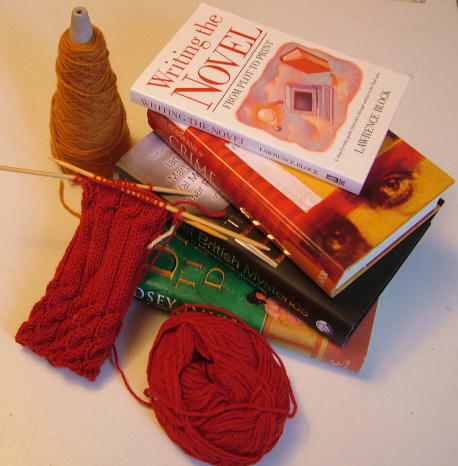 I am horribly behind with some of the reading I need to do this week and have some knitting with fast-approaching deadlines. And then there's the allotment - news on this next post. Got to go - playing catch-up here.